London is one of the world’s most famous capital cities and England’s largest city, offering an endless number of attractions, museums, historical buildings, and entertainment options. London can be an overwhelming city for many travelers, especially those visiting for the first time. We’ve put together a recommended 6 day London itinerary that will help you see the highlights if you have at least 6 days in London. It includes all the major attractions (e.g., Tower of London, Westminster Abbey, and the National Gallery), but also includes several lesser known sites and encourages you to explore several of London’s diverse neighborhoods including Westminster, Greenwich, Kensington, and Camden. We suggest using this itinerary as a starting point for planning your 6 days in London, not as a definitive itinerary, and you can edit it to put together your own personal itinerary that reflects your own needs and interests. In addition to the 6 day itinerary, we also provide tips on how to get around London, maps of each day’s suggested attractions, and how to save money during your 6 days in London. Before we share the day-to-day itinerary, here is some essential planning information on getting to London, getting around London, tips for saving money, how to find accommodation, and further resources for planning and making the most of your 6 days in London. London is easy to reach by plane, train, or car. London has six main airports: Heathrow, Gatwick, Stansted, Luton, Southend, and London City, and these airports collectively serve just about every region of the world. If you are arriving from an international location outside Europe, busy Heathrow is likely to be your arrival airport. See this airport guide for getting to and from each of the airports in London. 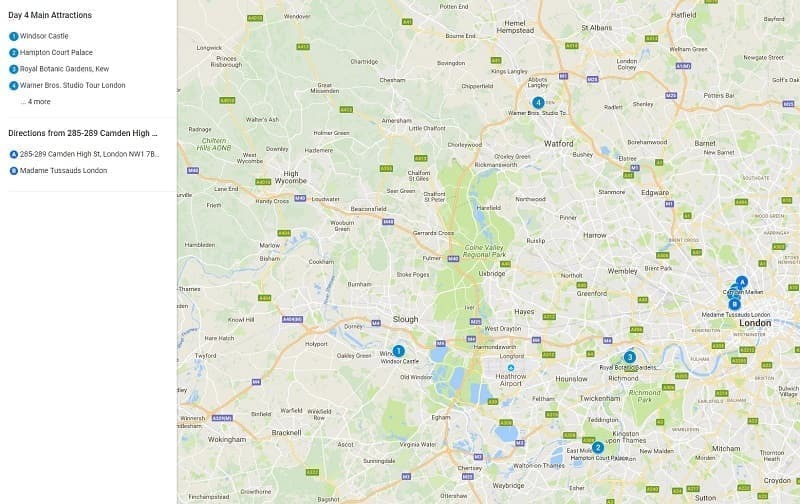 If you are arriving by train, London is well-connected to train routes throughout the UK and Europe with a number of train stations in and around central London. Those arriving from Scotland might want to consider an overnight sleeper train. If you are arriving from continental Europe by train or car, you’ll need to travel across the English Channel on EuroStar or take a ferry. London is best explored either on foot or by public transportation. Cabs and bike hires are also good options. If you need to book a cab, you can use minicabit to compare prices. I would not recommend driving in London unless you are planning to stay on the outskirts of the city as driving and finding parking in central busy locations can be a nightmare and parking can be expensive. If you are driving to London, I’d park your car when you arrive in the city and then use public transport until you leave. London’s has a great public transportation network and most visitors spend at least some time traveling on it. This includes public bus, tram, and rail services (including “the Tube”) within the city. You can buy individual tickets for each ride, but many visitors get an Oyster Card which allows you to travel on almost all the city’s public transit options and can save you time and money. If you are considering an Oyster Card, you can read our full review of it here. For more information and tips on getting around London, check out our detailed Guide To Transportation Options in London. Accommodation wise, London has about every lodging option you can imagine, from inexpensive hostels to self-catering apartments to pricey 5-star luxury hotels. London is home to some really iconic classic luxury hotels like The Ritz, The Dorchester, Brown’s, and The Savoy. But it also has a number of mid-range and budget friendly chains like Holiday Inn Express, Travelodge, Best Western, Premier Inn, Ibis, and Point.a Hotels. If you are spending a full week in London, you can often save money by booking an apartment at a weekly versus daily rate. To find the best rates on hotels in London, we recommend searching on Booking.com or Hotels.com as in our experience these two sites tend to have the best prices and widest choice on both hotels and a range of apartments. If you are looking for self-catering apartments or rooms, we also recommend checking out Airbnb although there are also loads of Airbnb alternative booking sites you can check. The Walrus Bar and Hostel – This is a well reviewed and centrally located hostel, found only a 15 minute walk from Parliament Square and the Palace of Westminster (Big Ben). SoHostel – Another well-reviewed hostel located just at the edge of Westminster, only a 15 minute walk from Trafalgar Square and the National Gallery. Point A Hotel – This hotel is located within Westminster and is within the well-priced Point A hotel range. It’s a 17 minute walk to Parliament Square and Westminster Abbey. We’ve stayed here; rooms are tiny but clean and a great budget option. Premier Inn – This well-rated mid-range 3-star option is located near to Borough Market and London Bridge. 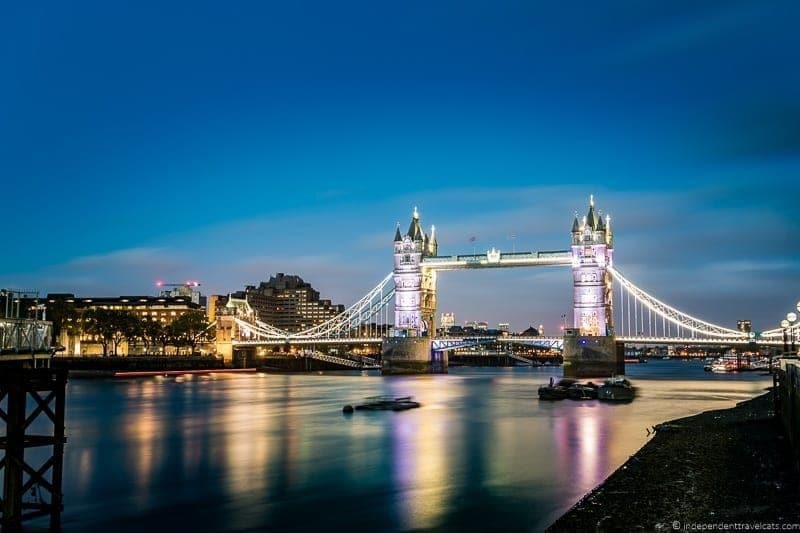 Hilton Tower Bridge – This well-rated hotel offers good value for this class of hotel and is located within a short walk of Tower Bridge, London Bridge, and Borough Market. Nadler Victoria Hotel – A centrally located 4-star hotel offering excellent value for money located near Buckingham Palace. We’ve stayed here; the lower priced rooms are small but the hotel is very well-located. Lord Milner B&B – This is a 5-star luxury bed-and-breakfast with uniquely designed rooms featuring antique furnishings and a good freshly cooked breakfast. We’ve stayed here and loved the well-decorated rooms and great location in Westminster. Brown’s – If you are looking for a classic 5-star London luxury hotel, you can’t go wrong with Brown’s which provides intimate boutique luxury. It is the oldest hotel in London and is located in Mayfair within a 12 minute walk from Buckingham Palace. The Savoy – Another classic 5-star luxury hotel, this one much larger, located in central London. Less than 10 minute walk to Trafalgar Square and the National Gallery. It is hard to deny that London is a fairly expensive travel destination and attraction entrance fee costs can really add up. Luckily, there are a number of London discount passes you can purchase which can help you save money if you plan to visit a number of London’s museums and attractions. 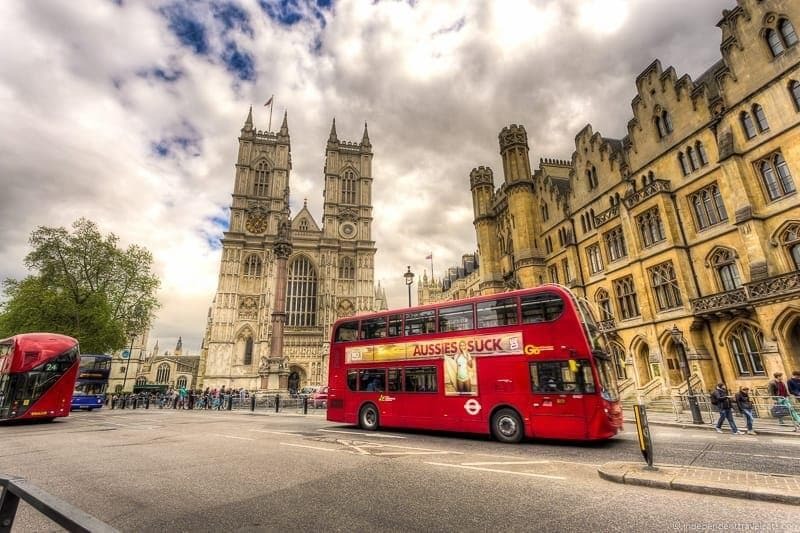 Our favorite is the London Pass which allows free entry into over 60 of London’s top attractions, and also comes with a free hop-on, hop-off bus ticket and additional discounts on food, shopping, and tours. We’ve used the London Pass on a number of visits and have written a full review of the London Pass which you can read to help determine if it is a good fit for your trip. Also be sure to check out all the free attractions in London which include top-notch museums, parks, historic sites, special events, and festivals. Another discount card option is the London Explorer Pass where you can choose up to 7 attractions you want to visit (out of 20) where you can get free entry into all these attractions (Westminster Abbey, London Dungeon, Madame Tussauds, Churchill War Rooms, London Eye). See a full list of possible attractions here. 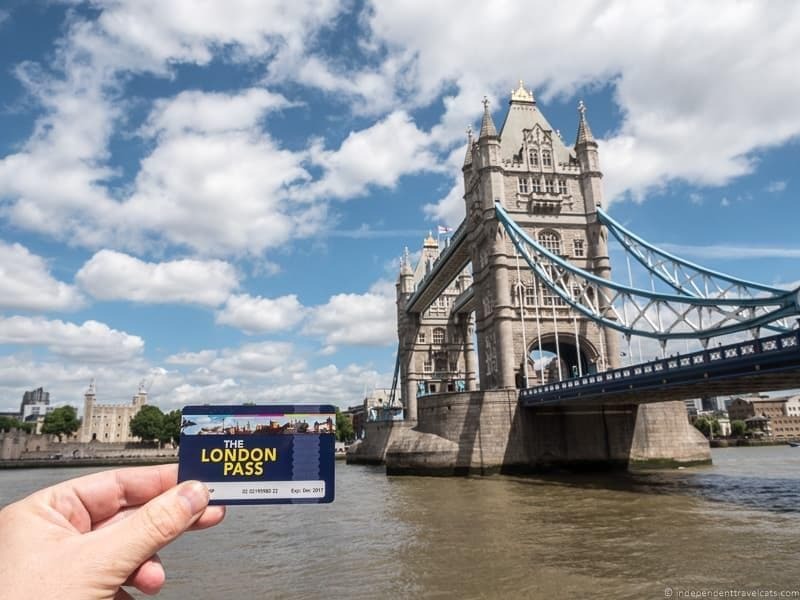 This card doesn’t work as well with our suggested itinerary but may be more appealing to some, especially families, as it includes more attractions geared to families that are not included on the London Pass. When visiting a new city, or when we just want to get a bit more local insight into somewhere we’ve been before, we’ll often take a walking tour. These offer a couple of advantages – you orientate yourself to a new place, plus you can get insider tips from a local on the best places to visit and eat. 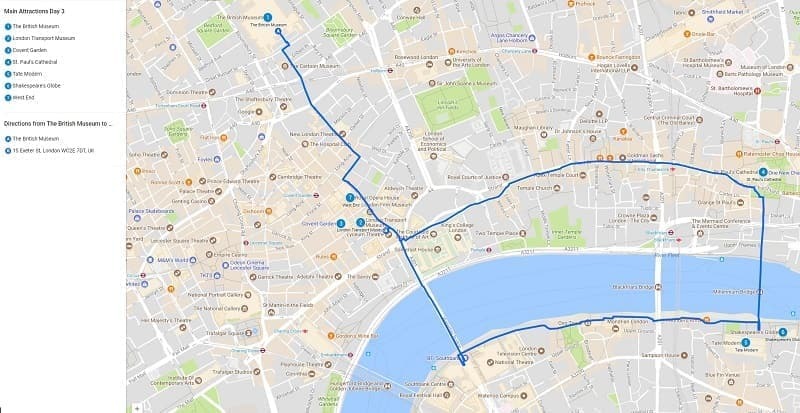 We’ve taken a number of walking tours in London, and a recommended introduction tour is this full-day walking tour which covers all the central highlights and includes a visit to the Tower of London, the Changing of the Guard, a short Thames cruise, and an afternoon tea. I did this tour on my very first visit to London and really enjoyed it! Another walking tour company to consider is Take Walks, who are behind the popular Walks of Italy walking tour company. They now offer a number of tours in London, and we can highly recommend them if you are looking for a walking tour in the city. See all their London tours here. If you have 6 days or more in London, then you may be wanting to do a day trip on one or two of those days and see some of the other towns and attractions in southern England. Stonehenge – Stonehenge is an ancient and mysterious stone circle and this site is one of the most popular day trips from London. It is probably best done as a bus day trip, but you can also do it via public transit (train plus shuttle), by car, or via a private transfer. You can read about our Stonehenge day trip experience here, which was a version of this tour of Stonehenge, Bath, and the Cotswolds. A couple other suggestions for guided tours are this express half-day trip to Stonehenge or this full day trip which includes inner stone access at Stonehenge and Bath. Stratford-upon-Avon – Stratford-upon-Avon is a picturesque medieval market town located along the River Avon in the West Midlands. It is best known as the birthplace of William Shakespeare and for its well-preserved Tudor buildings. Best ways to get here is by car, train, or by joining a tour. Here is a guided tour option that includes a visit to Stratford-upon-Avon and three Cotswolds villages. WB Harry Potter Studio – If you love Harry Potter, you may want to make time to visit the Warner Brothers Studio filming studio. The Studio Tour includes original film sets, clothing, props, interactive visitor experiences, and a huge gift shop. Tickets must be booked in advance. You can get here via public transit (train plus shuttle) or by booking a tour or private transfer. You can book a tour from central London that includes your transportation so you don’t have to take the train and shuttle. If you want to take a walking tour of the Harry Potter London film sites plus visit the WB Studio consider this guided tour. Oxford – Oxford is a scenic historical city that is home to Oxford University, England’s oldest university. Read our post about things to do in Oxford and how to plan your own Oxford day trip from London. Oxford is easy to reach by train, although car and bus are also options. If you are interested in a guided tour, you might consider this tour which visits Oxford as well as the Cotswolds. Highclere Castle & Downton Abbey Sites – Highclere Castle is a country house best known for being a prime filing location in the British TV series Downton Abbey. Easiest ways to get here is by car or by joining a tour. Here is a suggested guided tour option that includes a visit to Highclere Castle, castle gardens, Bampton, and other Downton Abbey filming locations. Highclere Castle is open seasonally so check opening dates before planning a visit. Portsmouth – Portsmouth is a port city and naval base where you can discover over 500 years of naval history. You can visit a number of boats dating back to Tudor times, museums, and other attractions along the historic dock. From London, you can get there via public transit (train is best) or by taking a guided tour. If you visit on your own, we recommend checking out the Portsmouth Historic Dockyard Attraction Ticket. If you are looking for a guided visit, you might consider this full day private one which includes transport from London. Cambridge – Cambridge, like Oxford, is a historic scenic university town. Cambridge University was founded in 1209 and is the second oldest university in the English-speaking world. There are a number of historical attractions and museums here, and you can check out our guide to things to do in Cambridge. You can get here by public transit (train or bus), car, or by joining a tour. If looking for a tour from London, you might check out this guided tour or this small group tour to Cambridge and Ely Cathedral. If you are looking for packing tips, check out our suggested London packing list. If you have less than 6 days in London, we have also written a suggested guide to spending one day in London, two days in London, and three days in London. We also a have a post about seeing the best of the city and its royal sites in a one day London walking tour. We have written a ton of content about London, so you can check out our London articles on Finding the Universe and our London articles on this blog for more info and to see where we’ve been. For additional planning resources, the Visit London and Visit Great Britain websites also offer tons of helpful information for visitors. If your travels are taking you beyond London, you can check out Laurence’s suggested 2-week UK itinerary to get you started. London is one of those cities that has an endless amount of attractions, museums, shows, and potential things to do. This can be overwhelming for many visitors so we’ve put together our suggested 6 day itinerary that takes in London’s most popular attractions as well as several of London’s best neighborhoods. I’ve also tried to arrange them in a logical order so you spend less time traveling around the city. Use this as a guide and starting point for planning your 6 days in London, not as a definitive itinerary, to put together your own personalized itinerary that reflects your own needs and interests. Be sure to check on admission days and hours for any must-see attractions before you set out as many attractions close for one day per week, or may be closed due to a special event or renovation. For all attractions with an admission fee, we’ve noted there is an entry fee by writing “(fee)” next to them. Note that since many people use the London Pass, the attractions that are included on the London Pass are starred (*) denoting that passholders receive free entry so they have “(fee*)” next to them. We do our best to provide the most updated information, but things change so you may want to double-check fees and London Pass inclusions before your trip. On your first full day in London, I’d head to Westminster. Westminster is a great place to start your exploration of London as it is the political, cultural, and geographical center of the city. It is also where you’ll find some of London’s most iconic and famous buildings. The itinerary starts and stops near Parliament Square but can begin it at any point along the route. First, you might consider taking a tour to get oriented to the city. 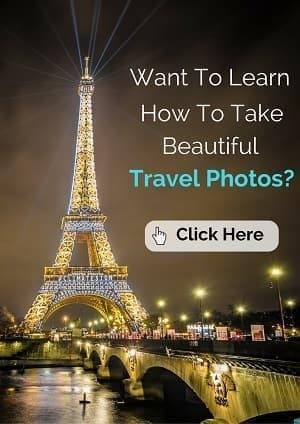 If you are the kind of person who likes to get a good overview of a city before striking out on your own, a sightseeing bus tour, bike tour, Thames river cruise, or city walking tour is a great way to get oriented. You have loads of options in terms of companies and London Pass holders have access to a free sightseeing hop-on hop-off bus tour, bike tour, and a Thames cruise which all cover the Westminster area. If this sounds appealing, I’d probably recommend either a walking or bus tour for your first day. 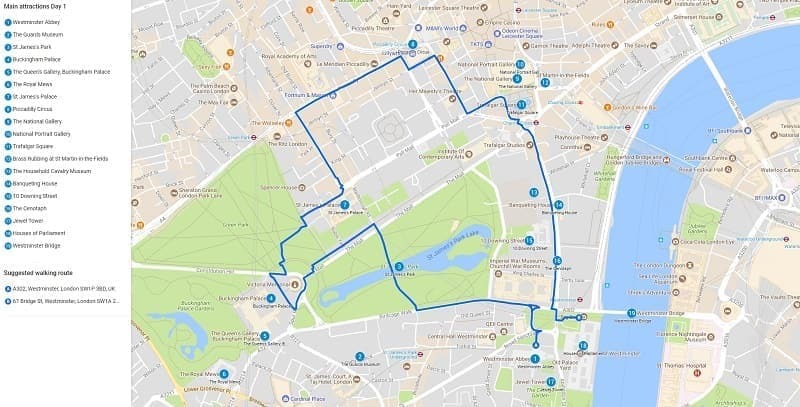 If you choose a walking tour, most need to be booked in advance, and you can read about one of the guided walking tours of Westminster we did on my very first trip to London to get an idea of what you can cover on foot in the area. As mentioned earlier in the post, we also often use and can recommend walking company Take Walks. They have a number of London walking tours to get you acquainted with London. 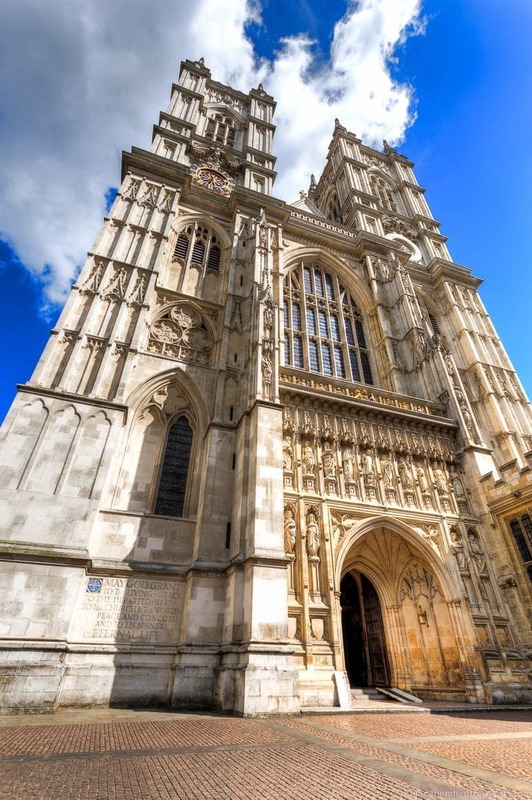 Westminster Abbey (fee*) is definitely one of the most impressive and historical churches in England. The church (and its Norman predecessor) has been the site of all English and British coronations since William the Conqueror in 1066 as well as the site of over a dozen royal weddings, including Prince William and Catherine Middleton in 2011. The current church dates from 1245, being built mainly from the 13th century to 16th century, and was mostly built in the Gothic style. The church is a coveted burial spot and includes the tombs of British royals as well as Prime Ministers, famous artists, writers, and scientists, and other famous people from the past 1,000 years! This is a popular place so be sure to leave some time to get in and explore. The included audio guide helps give you a lot of background on the church and points out all the highlights. Guide-led tours are also possible for a small extra fee (currently £5/person), check at arrival or on the Abbey website for tour times. In June 2018, the Queen’s Diamond Jubilee Galleries opened. The galleries, which are reached by the newly build Weston Tower, house historical exhibit and treasures owned by the Abbey. Admission to the Galleries is currently an extra £5.00 and requires a timed ticket as space is limited. For a breath of fresh air, take a walk through St. James’s Park en-route to Buckingham Palace. The park is one of eight of the city’s Royal Parks and has over 50 acres of green spaces, flower beds, and even a lake that contains some famous resident pelicans. There is a small café here and it is a great place to take a short break. Also for those interested in the Guards regiments of the British Army, you can make a stop at The Guards Museum (fee*) which is just across from St. James’s Park, next to the Wellington Barracks. Buckingham Palace is probably the most famous palace in the UK and it serves as the primary London workplace and residence for the reigning sovereign of the United Kingdom. It was originally built as a private residence by the Duke of Buckingham (hence the name) in the early 18th century, but was later acquired by British royalty and expanded over time. The public can tour Buckingham Palace (fee, book tickets in advance) but only for about 8 weeks per year (generally August and September). However, you can get a good view of the palace from outside the gates year-round and you can walk up to see the marble and bronze Victoria Memorial that stands in front of the palace at the end of The Mall. 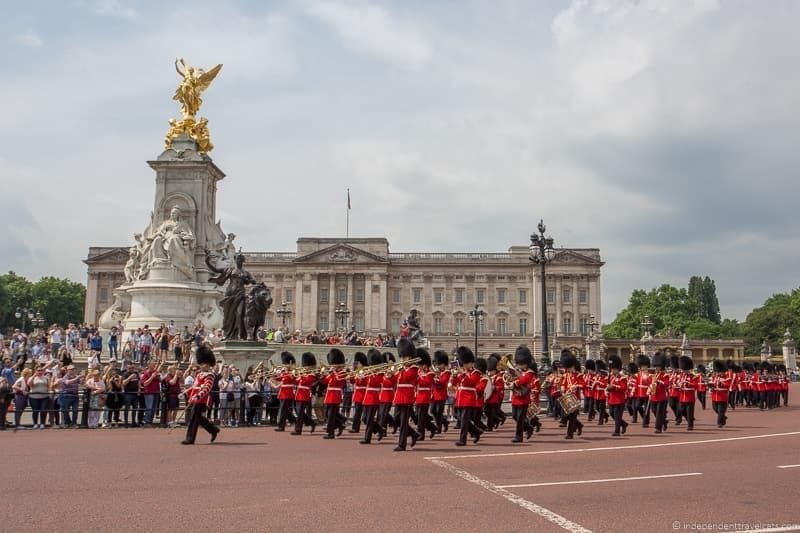 Depending on the day of you visit (as well as weather and security conditions), you may get a chance to see the Changing of the Queen’s Guard ceremony at the forecourt of Buckingham Palace which often takes place around 11am. The full ceremony lasts about 45 minutes. If you want to see the Changing of the Guard ceremony, check the schedule online in advance and show up early to get a good viewing spot. If you don’t want to stand in the crowds, you can try going to Friary Court in front of St. James Palace for the ceremony (the Old Guard normally lines up and starts here) or watching the Changing The Queen’s Lifeguard (horse guards) at the Horse Guards Parade as both spots attract fewer visitors. Even if you can’t visit the State Rooms of Buckingham Place, there are places to visit on the palace grounds year round. 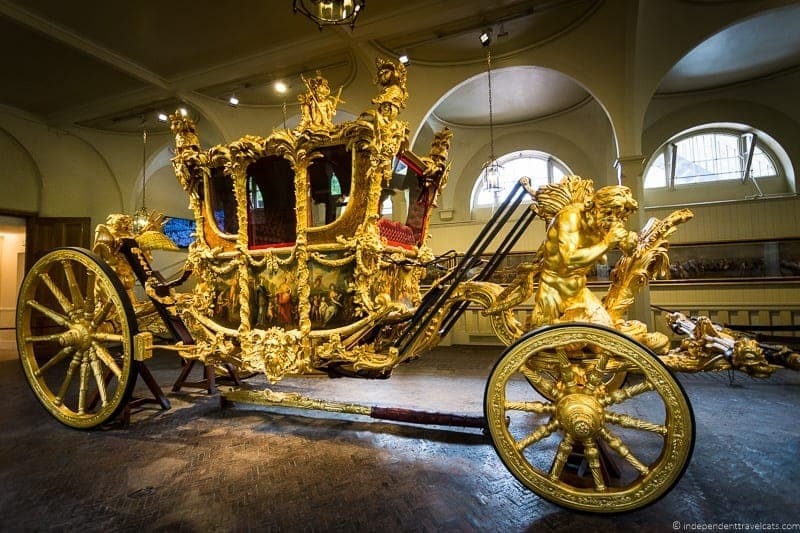 You can visit the Royal Mews (fee*) which showcases the royal collection of historic carriages and coaches, including the Diamond Jubilee State Coach. Art lovers will want to stop at the Queen’s Gallery (fee*) which displays regularly changing exhibitions of art from the royal collection. St James’s Palace is the most senior royal palace in the United Kingdom, having been built during the reign of King Henry VIII in the 16th century. Although it is no longer the residence of the monarch, it is the meeting place and London residence of members of the British royal family. The palace is not open to the public but as noted above you can see the start of the Changing of the Guard ceremony from Friary Court in front of the palace. Piccadilly Circus is a famous road junction and a popular public meeting spot in London. The area is famous for its large neon signs and video advertising as well as the Shaftesbury Memorial with its statue of Anteros. The spot is well-located for an easy walk to the West End theaters and Regent Street, one of London’s major shopping streets. Trafalgar Square is a popular public square in central London known for its monuments, architecture, street artists, and surrounding museums. The square itself is home to Nelson’s Column (a monument commemorating Admiral Horatio Nelson, who died in the Battle of Trafalgar in 1805), the famous stone lion statues, and the featured contemporary art on the Fourth Plinth. Around the square you’ll also find two of London’s top art museums, the National Gallery and the National Portrait Gallery. Both are highly recommended for art lovers and include works by some of the world’s most famous artists from Turner to Monet. Also nearby (hidden underground in St. Martin-in-the-Fields!) you can visit the London Brass Rubbing Centre (fee*) to learn about and create a brass rubbing to take home. A great activity for families (we had fun too!). Whitehall is the main street running south from Trafalgar Square towards Parliament Square. This area was once home to the Palace of Whitehall, a sprawling royal palace complex and the largest palace in the world until it burned in 1698. 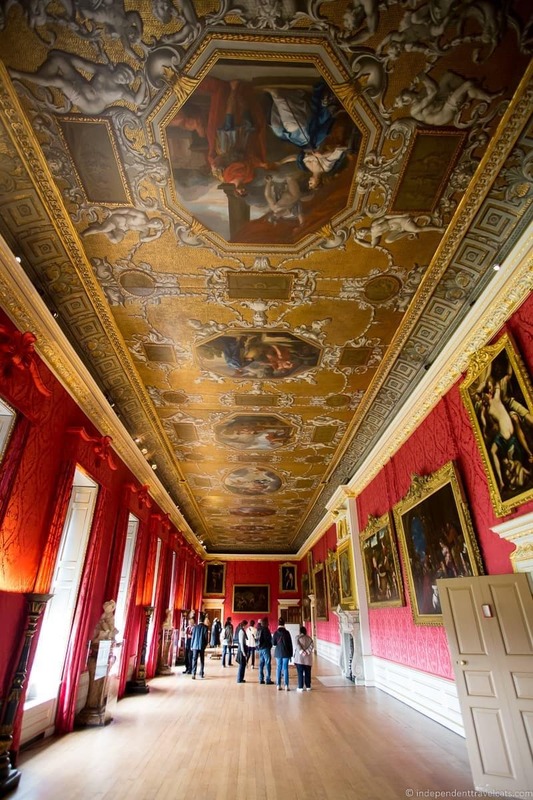 However, today visitors can still see one remaining section of the palace complex, the Banqueting Hall (fee*) designed by famous architect Inigo Jones with a ceiling painted by Peter Paul Reubens. Today Whitehall is the center of the Government of the United Kingdom and you’ll pass a number of buildings home to various departments and ministries, including the Ministry of Defense and the Cabinet Office. Along this street you’ll also find The Household Calvary Museum (fee*), located in the 18th century stables of the Horse Guards, which gives information on the history of the Household Cavalry and displays a small collection of uniforms and weapons. Past the Banqueting Hall and Household Cavalry Museum, you’ll pass the entrance to Downing Street. The street is gated and guarded, but you can peek through and should be able to see the door to 10 Downing Street, which is the headquarters of the UK government and official residence of the Prime Minister. There are a lot of statues and memorials along the street, including The Cenotaph, which has been designated as the United Kingdom’s official national war memorial. As you continue down Whitehall, you’ll end in Parliament Square. Parliament Square is a public square where you’ll find a number of statues of famous people, including Winston Churchill, David Lloyd George, Abraham Lincoln, and Nelson Mandela. The square is surrounded by famous buildings, including Westminster Abbey and St. Margaret’s Church, the parish church of the Palace of Westminster. 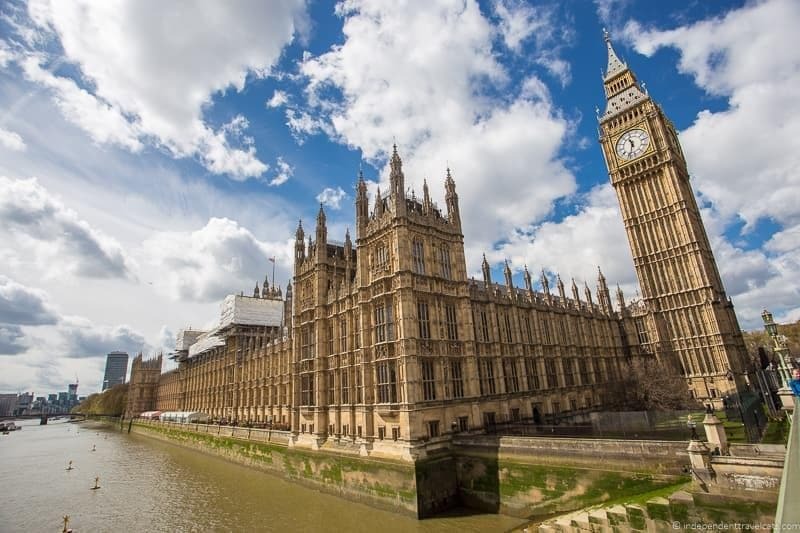 On one side of the square you’ll see the iconic Palace of Westminster, better known as the Houses of Parliament, with the iconic Elizabethan Tower which contains the famous Big Ben bell. The building is named after the former medieval palace that once stood here, and you can actually visit a section of the old palace, the 14th century Jewel Tower (fee*), if you want a sense of what the original Palace of Westminster was like. The public can visit the Houses of Parliament on certain dates, and debates are free for the public to watch. 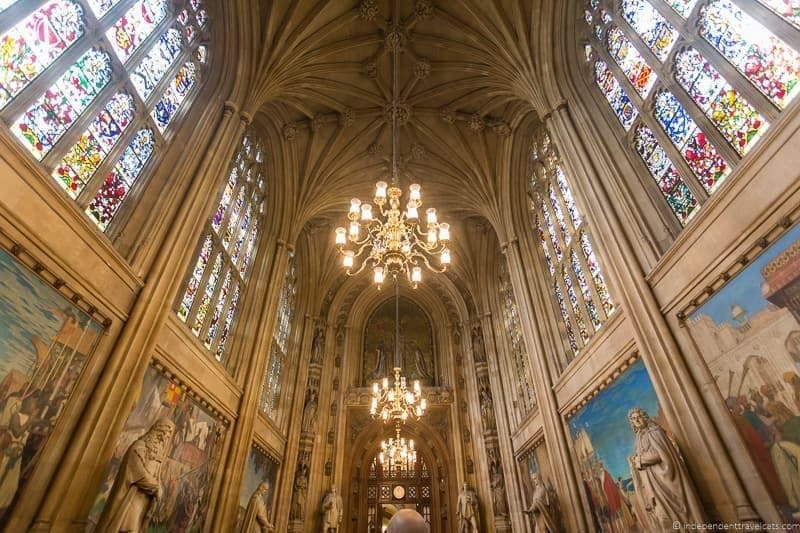 But if you want to actually tour the building, tours are available on certain days of the week and the tours include a number of rooms, including Westminster Hall, St. Stephens Hall, Commons Chamber, and the Lords Chamber. UK residents can contact their local MP or a Member of the House of Lords to request and arrange a free tour. Otherwise, you can book a tour ticket online for a self-guided audio tour or guided tour. The tour here is well worth it if you have the chance to do it during your visit. We did a guided tour plus a Thames-side afternoon tea here and really enjoyed seeing the inside of this iconic building! After you have visited all the spots you want to in and around Parliament Square, walk onto Westminster Bridge and look back for a great view of the House of Parliament and the River Thames. You can then take a walk along the Thames or head off to dinner. Tomorrow the itinerary will bring us back to the Thames to further explore more of London’s iconic sites. Today we’d suggest heading back into central London and focusing on sites located along the famous River Thames, London’s main river and the longest river in England. The Day 2 itinerary takes you to more of London’s most historic and iconic sites and attractions. It starts at the Tower of London and ends either at the Churchill War Rooms or the London Eye, depending on your time, energy, and interests. The first part of the itinerary is walkable but you’ll probably want to use the Thames river boat or public transit to get from the bridges to the Churchill War Rooms. If you want to do a Thames river cruise, this is a good day for it. The Tower of London (fee*) is a UNESCO world heritage site that has served as a fortress, prison, armory, Royal Mint, and place of execution among other uses during its long history. 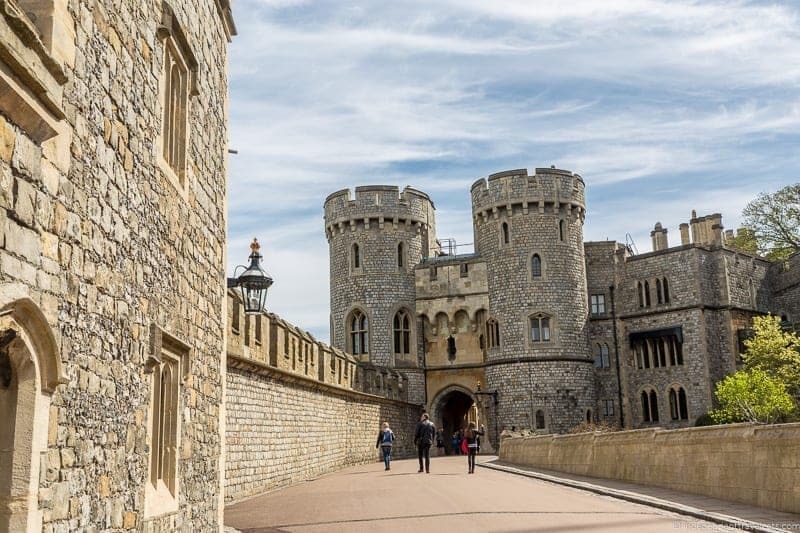 It is famous for serving as a prison and execution site of famous people like Queen Anne Boleyn and for housing the Crown Jewels. There is a lot packed in here and highlights include the Crown Jewels, White Tower, Tower Green, and tours given by the Yeomen Warders (Beefeaters). This is a popular place so we’d strongly recommend trying to get here around opening, head to the Crown Jewels first, and plan to spend at least 2 hours visiting here. One of our favorite attractions in central London but also one of the most crowded so do try to get here early! Today is a good day to do a sightseeing boat cruise of the River Thames, as all the suggested locations today are alongside the river. There is a City Cruises (fee*) dock just a short walk from the Tower of London and you can use the cruise to see the city from the Thames and get to the next location with a 24 hours hop on, hop off cruise ticket. Another option is to get a River Roamer pass for the Thames Clipper, a commuter boat service, or just buy a single ticket for a one time ride. Of course, you can also just walk to each attraction or take public transit. Next suggested stop is HMS Belfast (fee*), which is permanently moored on the Thames a short walk from Tower Bridge on the south bank. This historic warship, operated today by Imperial War Museums, will definitely be of interest to military buffs, or anyone with an interest in boats. Launched just before the outbreak of World War 2, this Royal Navy Light Cruiser saw action in both World War 2 and the Korean War, before being decommissioned in 1963. Since 1971 she’s been a popular London tourist attraction, and you can spend a good deal of time learning all about operational life on board this historic warship. There is a small cafe next to the visitor entrance to the ship which serves fresh sandwiches, salads, pastries, and coffee if you need a bite to eat. 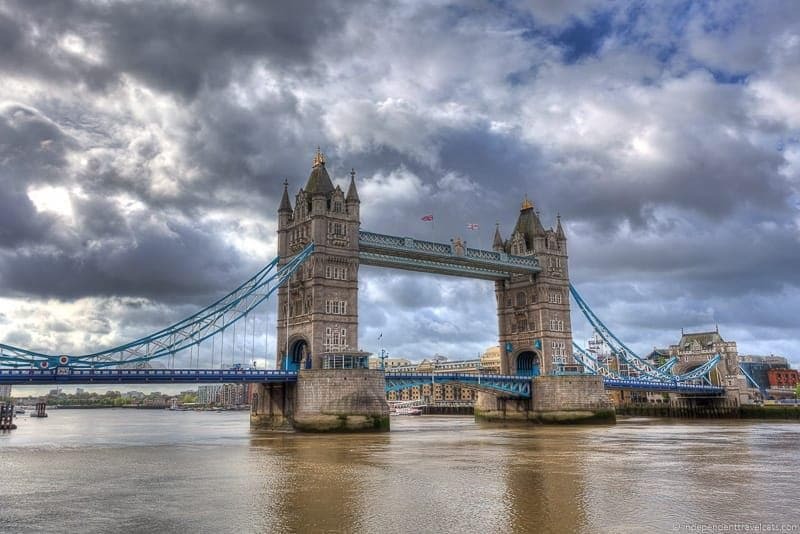 Next I would take some time to appreciate two of London’s most famous bridges, the London Bridge and Tower Bridge. Both bridges have exhibitions you can visit, although in terms of time I would choose to visit only one exhibition or just admire them both from the outside. London Bridge is famous for being the subject of the nursery rhyme “London Bridge Is Falling Down” and there has been a London Bridge since Roman times with the current one dating only to the 1970’s. The London Bridge Experience (fee*) is an interactive educational and amusement attraction geared towards families with children and young adults that don’t mind a bit of a scare. The bridge in London which you are probably more familiar with in terms of photos is the Tower Bridge, often mistakenly called London Bridge by tourists. This iconic bridge opened in 1894 and is currently painted white and blue. If you want to learn more about the bridge, then you should visit the Tower Bridge Exhibition (fee*). Here you can learn about the history of the bridge, including how it was built and how the lifting mechanism works to allow ships through. 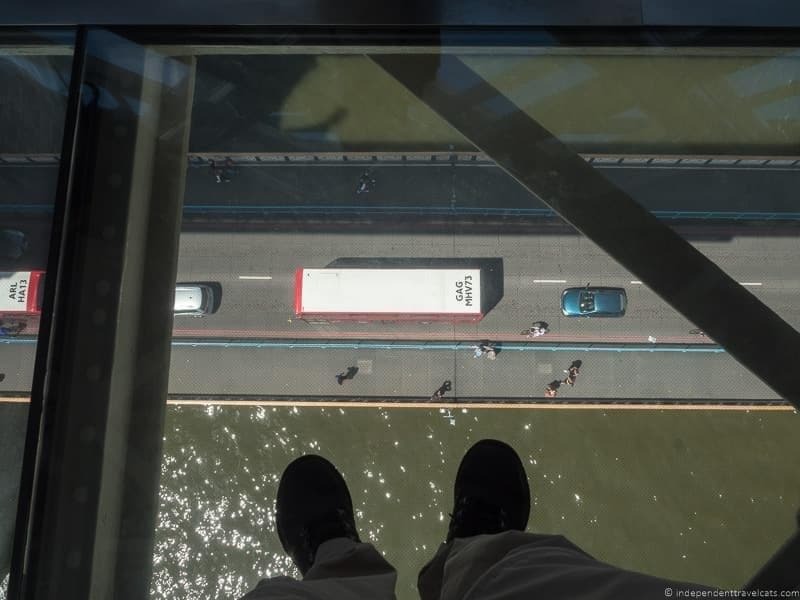 You can also walk the glass floor walkway across the bridge, a 138 feet high walkway that will definitely test any fear of heights you may have! view down from glass walkway of Tower Bridge! Alternatives (or additional spots) in the area to the above attractions: Southwark Cathedral, Borough Market (one of London’s most famous food markets), The Old Operating Theatre Museum (fee*), The Monument (fee*), and The View from the Shard (fee*). Now, we are going to head back to Westminster to visit the Churchill War Rooms which are not too far from where you were yesterday. You’ll likely want to hop on the Thames boat to Westminster Pier or take public transit here. The Churchill War Rooms (fee*) are run by the Imperial War Museums (those with a military history interest will also want to visit the Imperial War Museum in London) and allow the public to visit the huge underground secret bunker where the majority of the war effort during World War 2 was directed from August 1939 to August 1945. The visit essentially includes two places: the Cabinet War Rooms and the Churchill Museum. You get to visit an interesting maze of rooms to see where communications and strategizing happened as well as where people ate, slept, and cooked during WW2. Then a separate large museum room is devoted to the life of Winston Churchill and his legacy. It has the best collection of information and exhibits on Churchill that I have visited, and it covers his life from birth to death, not just the war years. There is an excellent audio guide included with the tour that covers the Cabinet War Rooms, For those with an interest in Churchill, we recommend checking out this article about visiting some of the top Winston Churchill sites. 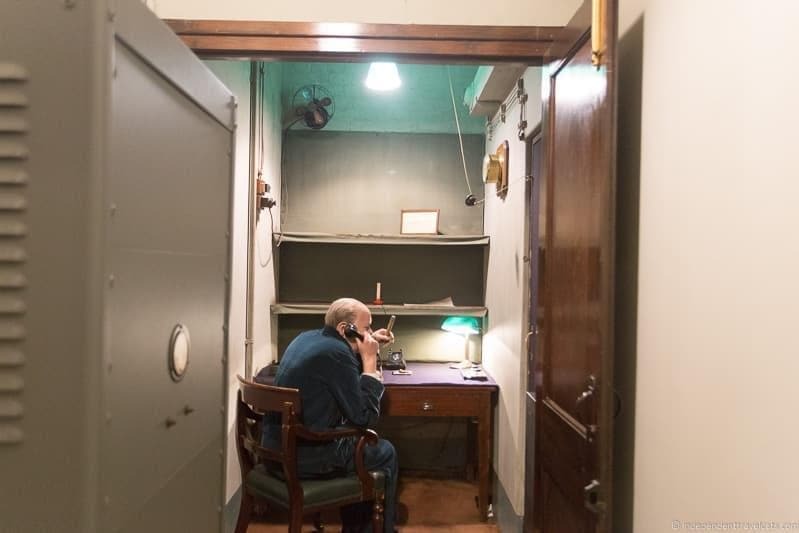 For those with an interest in Churchill and the London Blitz, we can also recommend the London Churchill War Room tour by Context Travel which includes a guided visit to the Churchill War Rooms as well as a guided tour of parts of London related to the Blitz. We love Context Travel tours, which are geared to the intellectually curious travelers, and if you book this tour or any other tour with Context Travel, using the link above you’ll receive 10% off any Context Travel tour anywhere in the world. Be sure to book in advance of your trip. If you still have time and energy you might want to continue on across the Westminster Bridge to where you’ll find more attractions, including the London Dungeon and the London Eye. The London Dungeon (fee) is an interactive attraction that uses costumed actors, rides, special effects, and staging to tell London’s more sinister history while offering up a bit of fun and scares. I wouldn’t come here for a history lesson but if you enjoy haunted houses and amusement parks, you’ll probably enjoy this. Not recommended for young children. The dungeon also sometimes offers adult-only nights that include food and drinks. Depending on who you are, the London Dungeon is either a must-see or a must-avoid! Next door to the Dungeon are also two family-oriented attractions, the Sea Life London Aquarium and DreamWorks Tours: Shrek’s Adventure. The London Eye (fee) is Europe’s tallest observation wheel and is essentially a giant slow ferris wheel with large enclosed glass pods. The London Eye is a great place to get some nice views of London, although I’d pass if the weather is terrible. It is open late so makes a great last stop, and around sunset is an ideal time to do the ride if the weather is pleasant. You can save money (and time) by purchasing your tickets in advance. Online prices are much lower than if you buy at the ticket desk. 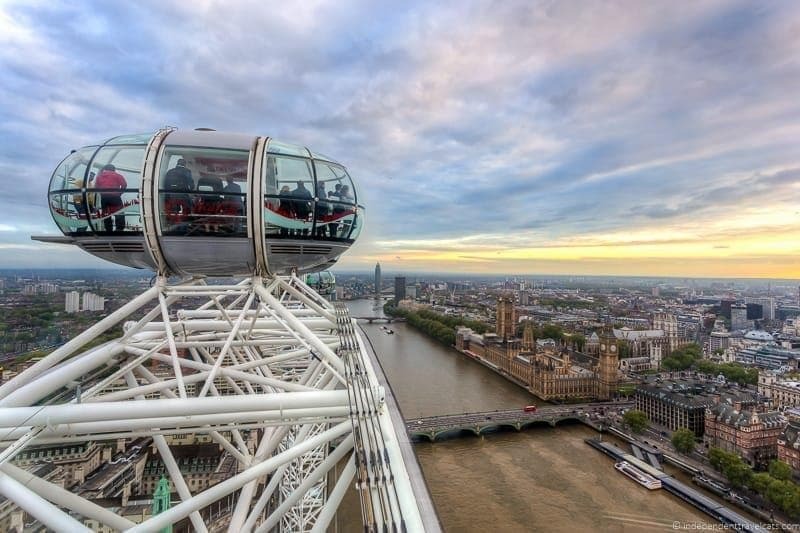 The least expensive London Eye ticket option (as of August 2018) is to purchase tickets here (standard tickets) or here (fast track tickets). Alternatively if you didn’t do a boat trip on the Thames already, you might consider booking an evening sunset and/or dinner Thames river cruise. There are several companies that offer these in London, including City Cruises mentioned earlier and Bateaux London. Today we are going to explore even more of London’s central highlights, including the British Museum, Covent Garden, St. Paul’s Cathedral, and Shakespeare’s Globe. Today all of the attractions are within walking distance but you may want to use public transit to reach some of them. 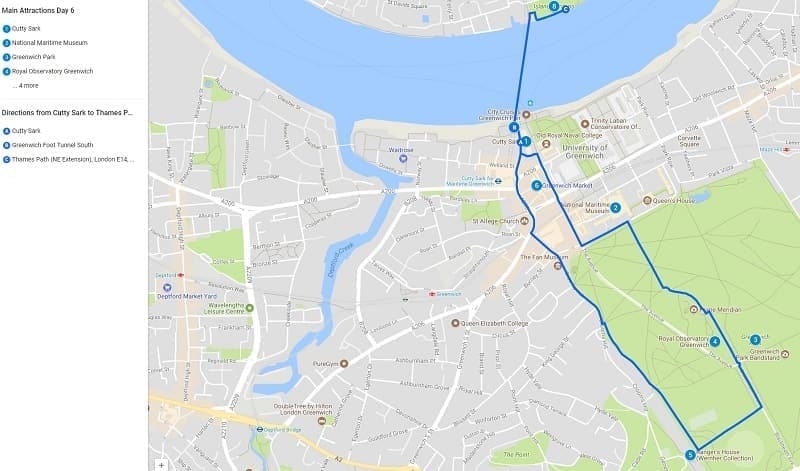 It may also be a good day to use a hop-on hop-off bus if you have a free ticket with the London Pass as the bus routes go to or near all the attractions on today’s route. The British Museum is a museum holding a vast collection of artifacts from cultures around the world, ancient to modern. Established in 1753 with the collection of just one man, it has grown to be one of the largest and most comprehensive collections in the world with about 8 million objects in its permanent collection! 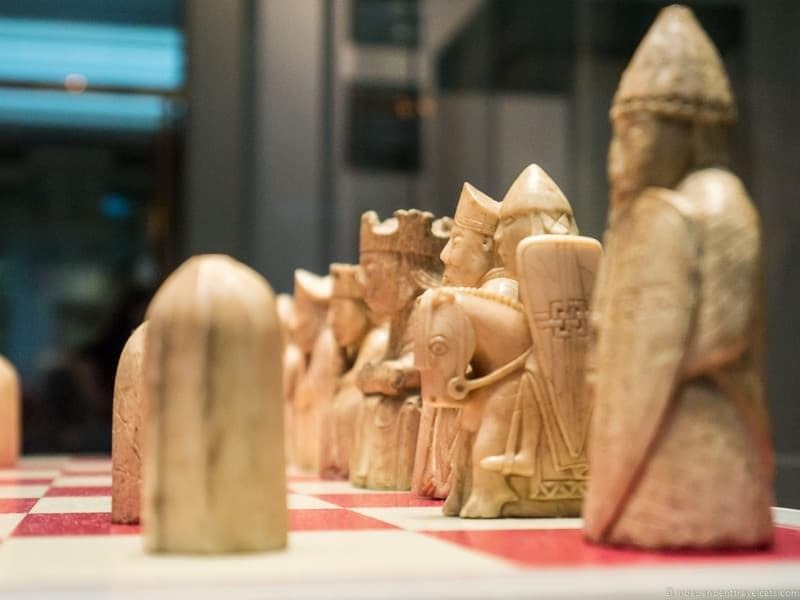 If you are going to only visit one general museum in London, this would probably be my recommendation as it holds a wealth of treasures from mummies to vases, with the Rosetta Stone, Parthenon sculptures, and Lewis Chessmen being some of its most well-known treasures. Now you can walk (about 15 minutes) or jump on public transportation to get to Covent Garden and the London Transport Museum. The London Transport Museum (fee*) is a museum dedicated to telling the story of London’s transport system over the last 200 years, highlighting the link between transport and the growth of modern London culture and society. The museum collection is housed in a 19th century building that was previously used for the Covent Garden Flower Market. 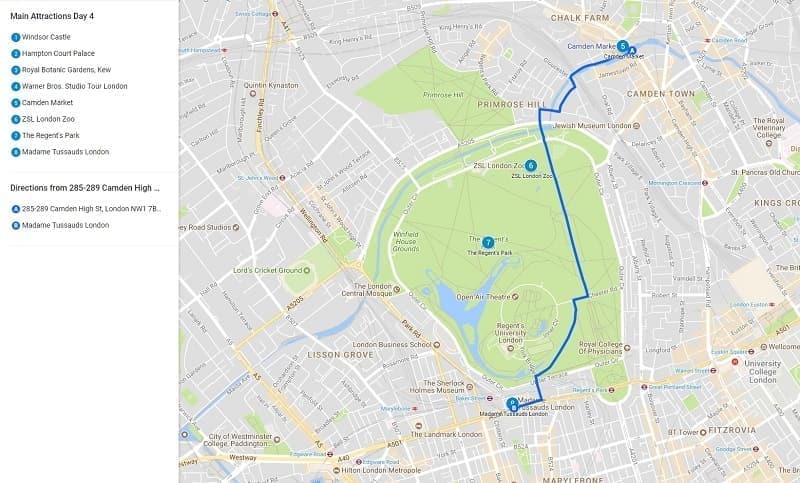 As a visitor you can follow a self-guided path that begins with what transportation was like around 1800 in London and then continues to the present day. So you get to see everything from human carried sedan chairs to horse-drawn omnibuses to steam trains to the famous red double-decker buses. The museum does a good job of having a mix of information and interactive exhibits. Covent Garden is a popular tourist destination in London. It originally was a food market (mainly fruit and vegetables) and by the 18th century had become a bit seedy and was also a popular red-light district. The food market eventually outgrew the space and was moved in the 1970’s and today the area is home to shops, cafes, pubs, two markets selling crafts, jewelry, souvenirs, and goods. It is a popular spot for street entertainers and you’ll often find crowds of people gathered around an entertainer here. The area has long served as an area of entertainment and the first known Punch and Judy like puppet show in England was performed here in 1662! An easy area to find a bite to eat if you are hungry as there are dozens of bars and restaurants here. Now you can walk on to St. Paul’s Cathedral (20-25 minutes) or take public transit. St Paul’s Cathedral (fee*) is an Anglican church designed by Sir Christopher Wren in the English Baroque style. The present church was consecrated in 1697; however, it sits on the same site as the former medieval church of the same name which was badly damaged by fire. Today it is the seat of the Bishop of London and one of the most important churches in London. The Cathedral was the tallest building in London for almost 200 years, and although no longer the tallest it can still been seen from many places in London and is one of the most recognizable places on the city skyline. The Cathedral has been the site of many famous services and events, including the state funerals of Lord Nelson and Winston Churchill, jubilee celebrations for both Queen Victoria and Queen Elizabeth II, and royal weddings such as that of Prince Charles to Princess Diana. 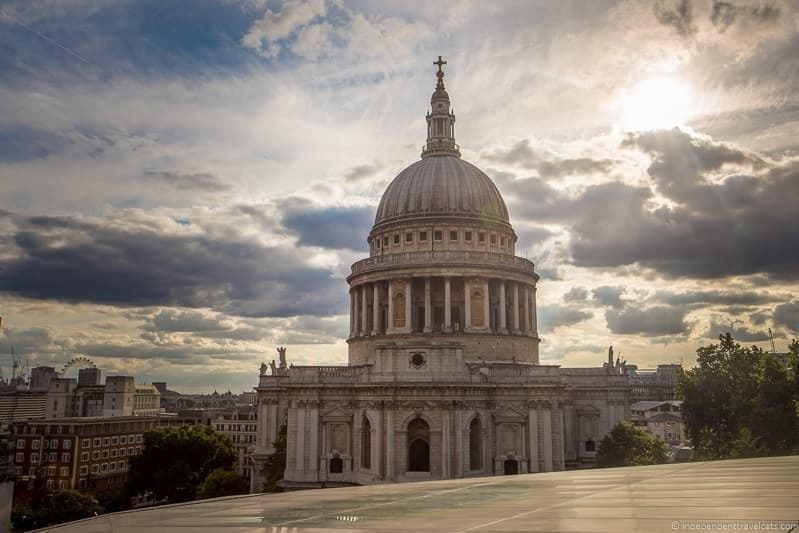 St. Paul’s Cathedral was a symbol of resilience during WW2 as images of the recognizable Dome still standing after the Blitz gave hope to people (although the church was damaged), and Churchill would give orders to try to protect the church at all costs. Services were held here after both WW1 and WW2 to give thanks for their end and to pray for peace. Admission prices include an audioguide for self-guided visits or you can join a regular guided tour of the church. St. Paul’s Cathedral is a busy tourist attraction so be sure to allot enough time, especially if you want to climb the steps to the dome which can have a long line. If you are planning to visit without a London Pass, especially in the summer months, we recommend booking your ticket online in advance to save money on admission and to get skip the line access. Worshippers attending a church service or wanting to pray in one of the side chapels can enter for free. An Alternative or additional stop in the area may be the Museum of London, which is a great free museum dedicated to the history of London. Now you can cross the Millennium Bridge, a popular pedestrian bridge, to reach the Tate Modern, the largest international modern art gallery in the UK. The museum’s location is unusual as it is based in a former power station building. The museum displays both a permanent collection as well as several temporary exhibitions throughout the year. Personally I prefer the Tate Britain (also in London) since I tend to like older art, but this is a must-see for modern and contemporary art lovers and has some great masterpieces. The museum is free to visit. A short walk away you’ll come to a famous white theater building. First let me say that the current Shakespeare’s Globe theater (fee*) is not the original and in fact this one only dates to 1997! The original Globe Theatre was built in 1599, destroyed by fire in 1613, rebuilt in 1614, and then demolished in 1644. The current one is a realistic reconstruction of the original (with concessions to modern health and safety requirements) and is located very close to the site of the original. 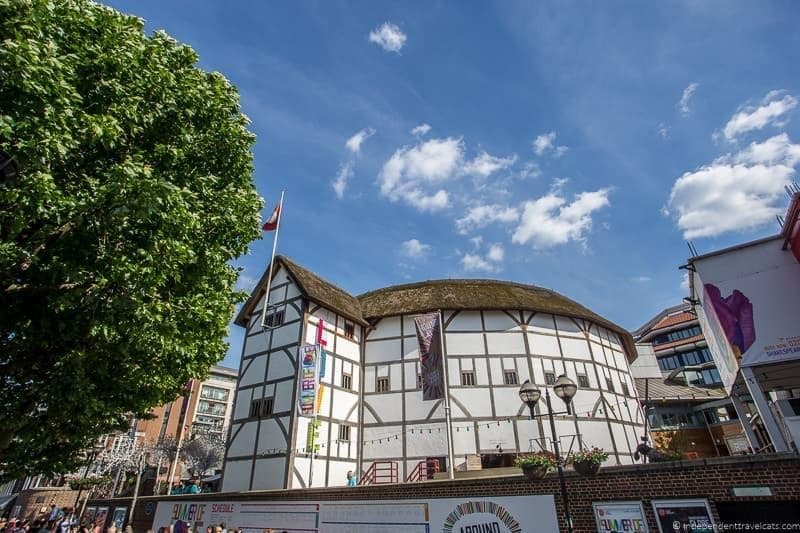 The man behind the rebuilding of the Globe is the late American actor and director Sam Wanamaker, who sadly died before the Globe was completed. The complex also has a museum exhibition about Shakespeare’s work and the original theater, a smaller candle-lit indoor theatre called the Sam Wanamaker Playhouse, and an educational and rehearsal space. 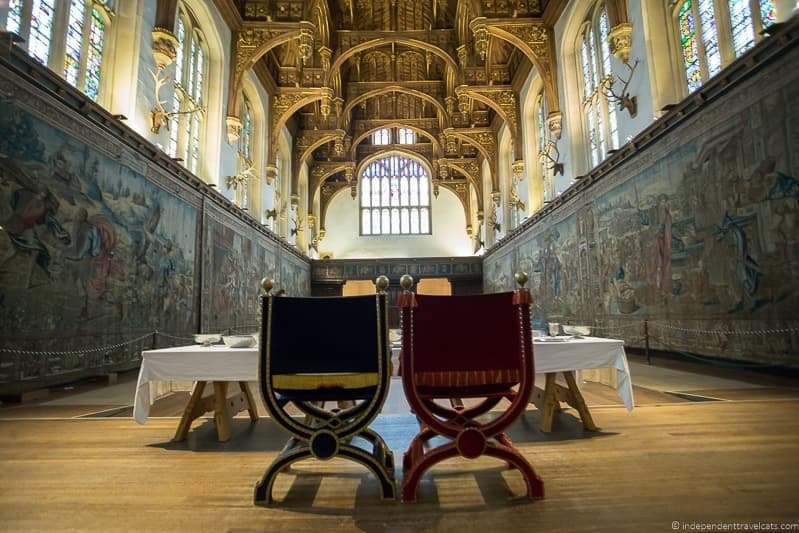 Today the public can visit the exhibition and take a guided tour of the theater, which allows visitors to experience what it would have been like to go to a theater in the Elizabethan era as either a lord or lady or as a poor groundling. You can also get tickets for performances at both the Globe (summer only) and the Sam Wanamaker Playhouse (year round). Tonight is a perfect evening to go see a West End Show performance, a performance in Shakespeare’s Globe, or other theater or concert event. London is full of nightlife throughout the year—concerts, shows, theater, opera, circuses, comedy shows—so you shouldn’t have a problem finding something that will appeal. If you are planning to go to a theater performance, you can book tickets in advance online before your trip (recommended if there is a performance you really want to see) or try to find a deal once you are in the city. Here are some tips for buying London theatre tickets. Note that London Pass users typically have access to theater ticket discounts on certain West End shows. 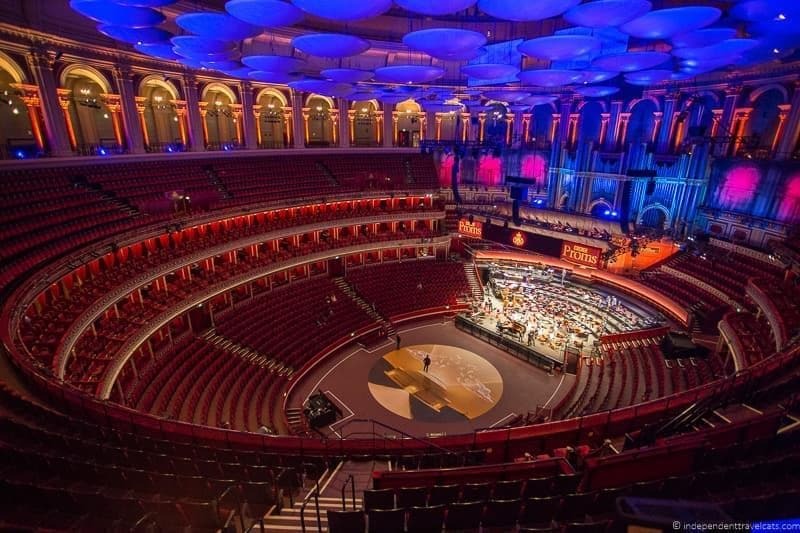 Also check out what is happening at the Royal Albert Hall during your visit, this world-famous venue hosts everything from classical concerts to rock bands to tennis matches! If you prefer a club or a bar to a theater, London has some of the best clubs in Europe. Here is a list of some of London’s top clubs to get you started. Note that most bars stop serving drinks between 11am and 2am, and here is a guide to some of London’s late night bars. If you have 6 days in London, I would head out of central London for at least one day. Today I’d recommend visiting one of the major attractions outside the city in the morning and then spending the afternoon in the borough of Camden. Camden is well-known for its markets, canals, zoo, and Regent’s Park. Alternatively, if you are not interested in visiting Camden, you could try visiting two of the recommended morning attractions (e.g., Windsor Castle and Kew Gardens). You’ll need to use public transit to reach the morning attractions and to get to Camden but the attractions in Camden are all within walking distance. Windsor Castle (fee*) was built as a defensive fortification by William the Conqueror in the 11th century. Today it is the largest and longest continuously occupied royal residence in the world. Much of the castle’s magnificent State Rooms were designed and built in the 19th century, and the castle is a common weekend home for Queen Elizabeth II. Highlights here include the State Apartments, Queen Mary’s Dolls’ House, and the 15th-century St. George’s Chapel. You can also see the Changing of the Guards ceremony here on certain days which is a similar but much smaller version of the ceremony that takes place in front of Buckingham Palace. There is an excellent audioguide included with admission and you can also join offered guided tours at the castle. Note that the castle can get very busy, especially in the summer, so try to arrive at opening time or alternatively you may want to visit in the afternoon. To get here you need to take a train out of London. You cannot use an Oyster Card and will need to buy a rail ticket. However, if you have a London Pass, travel to Windsor Castle is free if you follow the instructions. Hampton Court Palace (fee*) is a former royal palace, originally built in the 16th century for Cardinal Thomas Wolsey, a powerful person during the time of King Henry VIII. However, Wolsey would fall out of favor with the king (as most people did) and Henry would confiscate his house and use it as his own palace. The huge Tudor and Baroque style royal palace was used by British monarchs until the 18th century and is now a popular tourist destination. The palace is huge and you could spend all day exploring its many rooms, but luckily the self-guided tours are broken up by themes so you can decide which parts of the palace are of most interest to you. The gardens, the tennis court, and hedge maze are also definitely worth exploring here. This is a must-see for anyone interested in King Henry VIII and Tudor history. The palace is located in outer London and can be reached by public transportation. 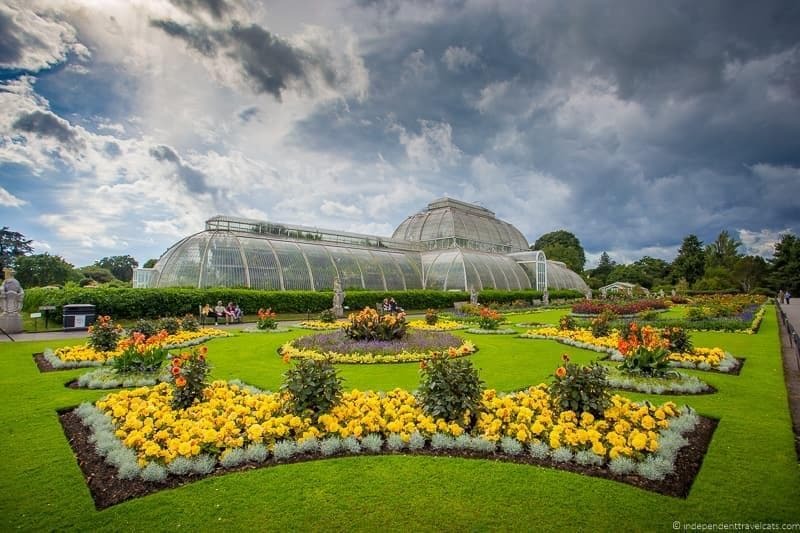 Kew Gardens (fee*) is considered one of the best botanical gardens in the world, housing over 8 million specimens. The gardens have “the largest and most diverse botanical and mycological collections in the world”, representing “over 95% of known flowering plant genera and more than 60% of known fungal genera”! Some highlights include the Palm House, Temperate House, Waterlily House, and Treetop walkway. A trip here offers more than just plants, as you can also visit art galleries, the Great Pagoda, and tour Kew Palace, a former royal residence located within the gardens. You can explore at your own pace or join one of the garden’s guided walk tours that come free with entry. This is a must-see for any garden lover. Kew Gardens are located in outer London and can be reached by public transportation. If you are a Harry Potter fan you might want to consider spending the morning at the Warner Brothers Studio located just outside the city. This film studio was where all eight of the Harry Potter films were actually filmed, and they have retained many of the original sets, clothing, and props from the movies. 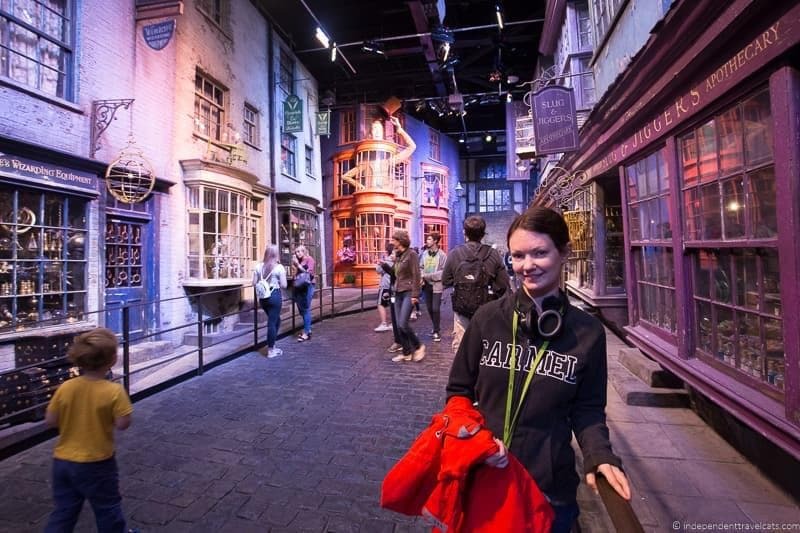 On the largely self-guided The Making of Harry Potter tour (fee), you can visit the Great Hall, the railway station, numerous filming locations from inside Hogwarts, the Forbidden Forest, and Diagon Alley. You’ll learn many of the secrets of how the films were made, have the opportunity to drink Butterbeer, and explore giant gift shops full of all things Harry Potter. Many people take 3.5 to 4 hours to visit here. So you’ll want to take this into account in planning your day as well as the time it will take you get there. This will be a full day trip for some. To get to the Studio, you can take a National Rail train (London Euston most convenient) to the Watford Junction station and then you can take the studio tour shuttle from the station to the film studios. You must book your tickets in advance online and have the voucher with you on your visit. You can also book a tour from central London that will take you directly to and from the studio so you don’t have to take the train and shuttle. Check out our detailed guide to the Harry Potter Studio Tour for more information, tips, and photos. 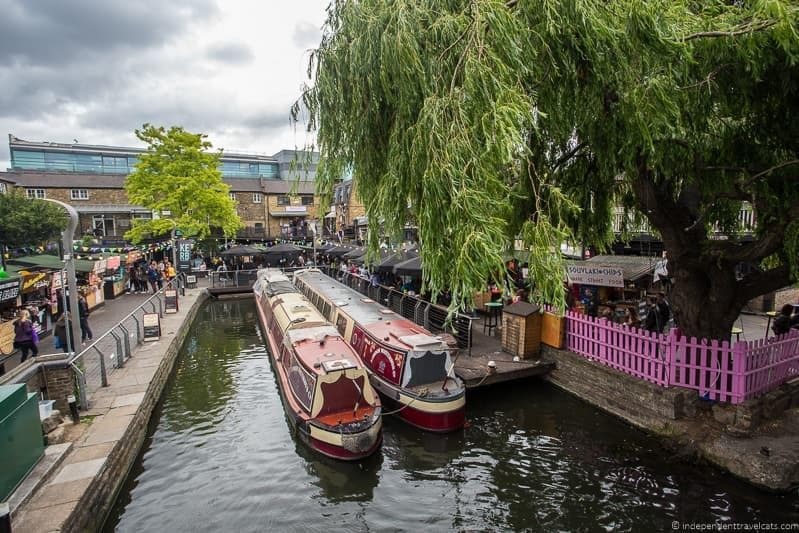 After a morning spent exploring a royal palace, marveling at Hogwarts’ Great Hall, or wandering around one of the world’s best botanical gardens, you might want to head to the borough of Camden. Camden is a diverse neighborhood that has been home to a number of famous people over the centuries from Charles Dickens to Sigmund Freud to Amy Winehouse. Once an industrial area known for shipping gin, it is now known for its markets, music scene, street art, and alternative fashion stores. It is also home to Regent’s Park and the London Zoo, and Camden Lock is a popular place to start a canal boat ride along the Regent’s Canal. Camden Market is not a single market, but consists of several different markets within walking distance of each other. Market stalls sell just about everything including food, clothing, crafts, art, souvenirs, and more. In addition to the market stalls, you’ll also find restaurants, bars, dance clubs, and other entertainment spaces here. It is a popular tourist destination as well as a meet-up spot for Londoners. Although the Camden Market is open daily, you’ll find it at its busiest and with the most open stalls on the weekends. Great place to find something to eat. The ZSL London Zoo is the world’s oldest scientific zoo and it was originally begun with a royal collection of animals that has been previously kept at the Tower of London. Today the zoo animals include lions, hippos, otters, gorillas, tigers, and giraffes. 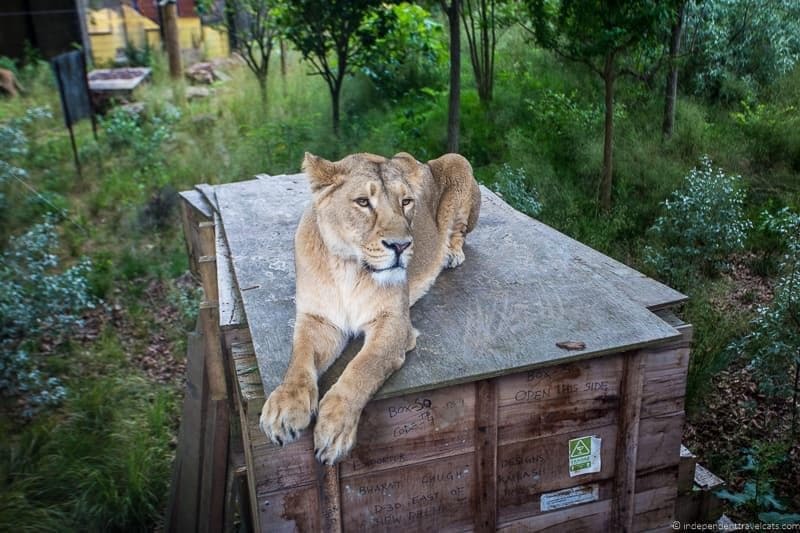 The newest exhibition is the Land of Lions which features a large interactive exhibit for its endangered Asiatic lions. The London Zoo also has a Reptile House, an aquarium, an aviary, and a large collection of insects. There are several places to eat, shop, and you can even take a photography workshop or spend the night in the zoo. The Regent’s Park is a large 410 acre royal park that is mainly open parkland. In the northern end you’ll find the London Zoo, but you’ll also find lots of open spaces, gardens, sporting pitches and facilities, children’s playgrounds, sculptures, memorials, and an open air theater. You can also rent a boat to row across its lake (seasonal), climb Primrose Hill for a nice view of London, or enjoy the roses at Queen Mary Gardens. There are also homes located in Regent’s Park, including Winfeld House, which has been the official residence of the U.S. Ambassador to the UK since after World War 2. A great place to have a break or enjoy a picnic (there is a restaurant located in the center of the park or bring your own food). If you still have time and energy, you can cross Regent’s Park’s (by foot or bus) and you can visit Madame Tussauds. Madame Tussauds (fee) is a museum displaying the waxworks of famous and historic people from Tudor royalty to current Hollywood film stars. The museum was started by an interesting French woman Marie Tussaud who traveled around Europe with her wax figure collection until opening a permanent location in 1835. Although many of the original figures have been destroyed or damaged by fire or bombing, some of Tussaud’s original figures still exist as well as older ones she inherited. The oldest existing figure displayed in the collection is one modeled after Madame du Barry dating from 1765, but the museum also includes everyone from Queen Elizabeth II to the band One Direction to Angelina Jolie. Although not for everyone, it is a popular place to take a selfie with your favorite stars. The museum has become a popular London attraction and there are now branches of Madame Tussauds around the world, but if you are only going to visit one, I’d visit the original! Alternative places you may want to visit in the area include the Sherlock Holmes Museum (fee) and the Jewish Museum (fee*). 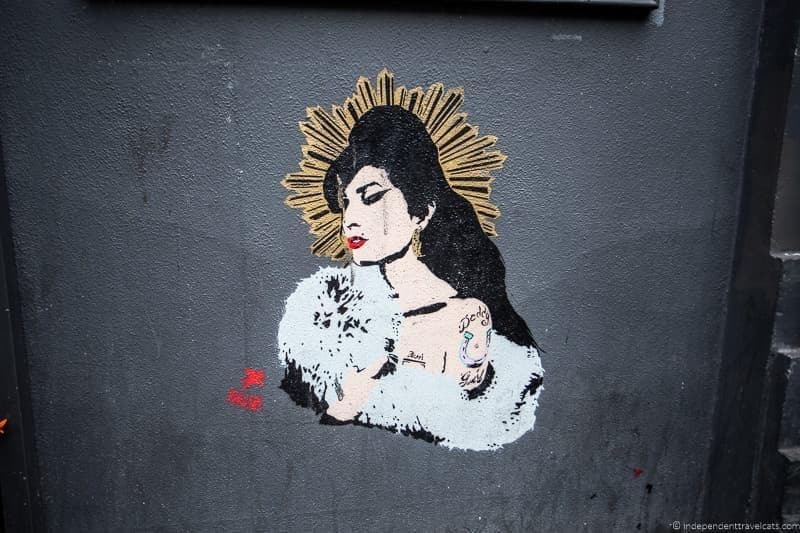 Note that if you are a fan of Amy Winehouse, you’ll find a Amy Winehouse statue near the Stables Market, street art dedicated to her memory throughout the area, and there was an exhibition at the Jewish Museum about her life and career when we last visited. Today I’d suggest exploring the London borough of Kensington & Chelsea, with a particular focus on South Kensington. This affluent area of the city is full of museums, galleries, stores, and world-class entertainment venues. Everything on the main itinerary is within walking distance (or a short public transit ride if you prefer). Kensington Palace (fee*) is a royal residence set in Kensington Gardens. It began as a fairly humble 17th century two-storey Jacobean mansion and was expanded by the royal family into the giant royal residence it is today. The palace might be best associated with Queen Victoria as it was here that she spent much of her unhappy childhood and first learned that she was queen. More recently it was the official residence of Prince Charles, Princess Diana, and their two sons. Today it is still an official private residence and workplace for many royals including Prince William and Prince Harry, but the State Rooms are open to the public. There is a lot to see here and it can be a bit confusing to try to wander around on your own, but luckily the palace has put together several different self-guided routes based on different themes and people (e.g., King’s Apartments, Queen Victoria, royal fashion) to help you get the most of your visit. There is a cafe here and the garden is a nice place to enjoy a cup of tea if the weather is pleasant. This palace can be very busy, especially in the summer months or when they have a popular exhibition. If you don’t have a London Pass I would recommend booking your ticket in advance and if you do have a London Pass, I’d recommend arriving near opening time. After visiting Kensnigton Palace, if the weather is nice, I’d spend some time exploring Kensington Gardens and adjacent Hyde Park. Within this large green space, you’ll find a number of gardens, sporting area, statues, biking trails, and boat rentals (seasonal). Some of the notable places to see or visit include the Serpentine Gallery, Serpentine Sackler Gallery, the Princess Diana Memorial, Peter Pan statue, the Elfin Oak, and the ornate Albert Memorial. An easy place to spend an hour or two. The Royal Albert Hall is a world-class performance venue that was opened in 1871 by Queen Victoria. The hall has hosted just about every kind of event which have included concerts by Richard Wagner, wartime speeches by Winston Churchill, rock concerts by the Beatles, tennis tournaments, Cirque du Soleil performances, and Star Wars films accompanied by a live symphony orchestra. It has been host to the BBC Proms for decades. If you are interested in going inside, you can take a guided tour of the Royal Albert Hall (fee*). Guided tours include the original carriage entrance, the auditorium, gallery, royal private box, and the private suites of the royal family. If you’d rather come for a performance, you can head inside to the Ticket Office. Note if you are on a small budget, inexpensive standing room only tickets are available for some performances, including the BBC Proms. It’s museum time! Kensington is one of our favorite areas for museums as it has loads of them, and the best part is that almost all of them are free to visit! Let’s talk about the three main museums, and you can choose your favorite or dive into all three. First you have The Science Museum which has information and exhibits on a range of scientific topics from genetics and electricity to space travel and virtual reality. There are loads of interactive exhibits that are both fun and educational. The museum also has an IMAX theater (fee*). Next you have the Natural History Museum and its giant life and earth science specimens are housed in a beautiful building that looks more like a cathedral than a museum. Its collection holds over 80 million items and you can see everything from dinosaur skeletons to specimens collected by Charles Darwin to a giant mineral collection. There is also a seasonal butterfly house (fee) at the museum. The Victoria & Albert Museum, often referred to as the V&A Museum, is the world’s largest museum of decorative arts and design, with over 2 million objects in its collection that spans 5,000 years of human history! You’ll find everything from Greek pillars to Chinese vases to Alexander McQueen gowns here. The museum is also known for hosting popular temporary exhibitions (fee*) throughout the year. Kensington is well-known as a shopping destination with many of its most famous stores located along Kensington High Street, Brompton Road, King’s Road, and Sloane Street. 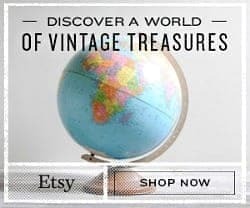 Among the hundreds of stores, you’ll find popular antique stores, the British department store Harvey Nichols, and the world-famous Harrods with its 1 million square feet of retail space which sells everything from speciality food to designer shoes! Harrods was started by Charles Henry Harrods as a small family-run shop, but like many British landmark institutions it is sadly now owned by foreign corporations (in this case the state of Qatar). 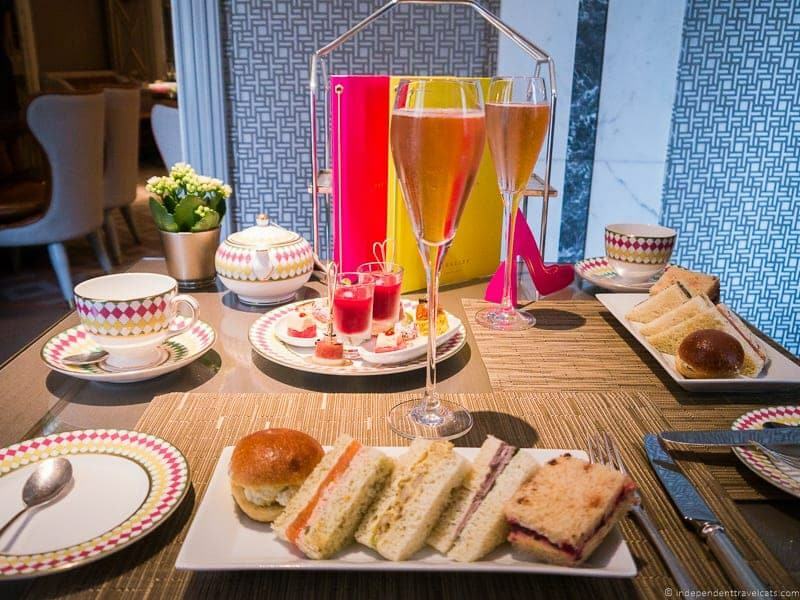 In addition to shopping, you might also want to stop for an afternoon tea, such as this fashion inspired afternoon tea in Knightsbridge. If you prefer a market, the Portobello Road Market in Chelsea is a popular market and at its best on Saturdays. There are many cafes and restaurants in this area if you are here at dinner time. Alternatives: There are many other things to see in the area (mostly in Chelsea), including the Chelsea Physic Garden (fee*), Leighton House Museum (fee), Design Museum, Portobello Road Market, Chelsea Football Club Stadium Tour & Museum (fee*), and the recently renovated National Army Museum. For your final day in London, consider spending the day in the London borough of Greenwich. Greenwich is world-famous as the traditional location of the Prime Meridian and for its observatory, but it also has a number of historical buildings, museums, a market, a giant park, and a famous tea clipper. A large portion of Greenwich, and most of today’s suggested itinerary, is part of the UNESCO World Heritage Site known as Maritime Greenwich. Or alternatively leave this day free to wander around London’s streets and parks, do some shopping, or catch up on places you missed on prior days. Maybe you want to simply spend a day relaxing by the Thames, exploring the latest art exhibits, buying gifts for loved ones back home, or checking out vintage clothing shops. This is also a perfect day to follow your specific interests and passions, whether it is searching for Harry Potter in London, checking out London’s best pubs, visiting Winston Churchill sites, taking a Jack the Ripper tour, checking off London’s World Heritage sites, exploring London’s street art, or finding the perfect fish & chips shop. The Cutty Sark (fee*) is a British clipper ship built in Scotland on the River Clyde in 1869. The ship is historically significant for being one of the last tea clipper ships ever built and one of the last clipper ships of this period still in existence. The ship was originally used to carry tea from China to England as quickly as possible and would visit almost every major world port during its life at sea. In later years as steam-powered ships became popular, the Cutty Sark was used for cargo transport and then as a training ship. It was dry docked here in 1954 and is now one of the area’s most popular tourist attractions. 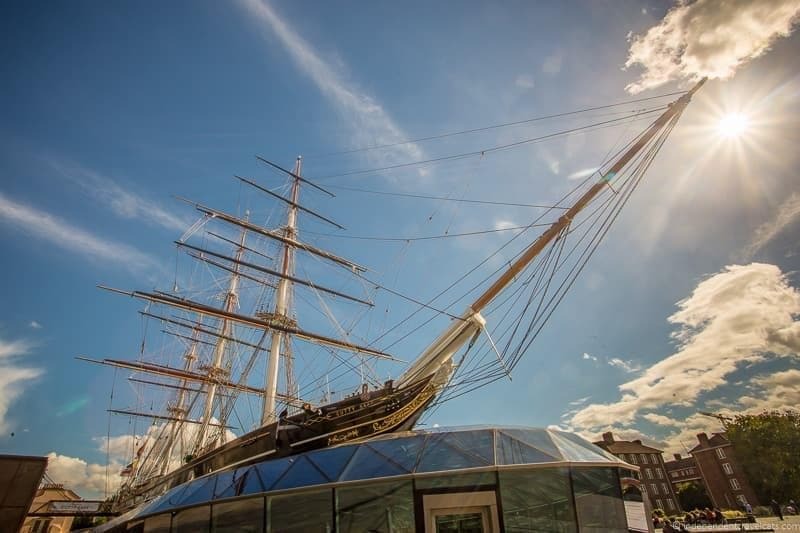 A tour of the Cutty Sark allows you to see the ship’s interior, learn about the ship’s history and what it was like at sea in Victorian times, hear stories of the people on board the ship, and see the ship’s hull up close as you walk underneath it. There is also a cafe in board where you can grab sandwiches or have afternoon tea (if you want a full afternoon tea, book it in advance). The Old Royal Naval College is a set of buildings designed by Christopher Wren whose original purpose was to serve as a place to care for and house retired seamen. Later the large building complex was used as a naval training college and today is used for a number of functions, and many of the buildings are open to the public. We’d recommend starting your visit at the Greenwich Visitor Centre which has some helpful information, displays, and artifacts. Then you can wander around the site to admire the buildings, and you can visit the Chapel and the beautiful Painted Hall, painted by James Thornhill in the early 18th century. Guided tours can also sometimes be arranged for those with a special interest to see more areas of the complex not usually open to the public. Before the Old Royal Naval College was built, the Palace of Placentia (better known as Greenwich Palace) sat here which was the birthplace of King Henry VIII and his daughters and later queens Mary I and Elizabeth I. You can learn more about it in the Greenwich Visitor Centre. 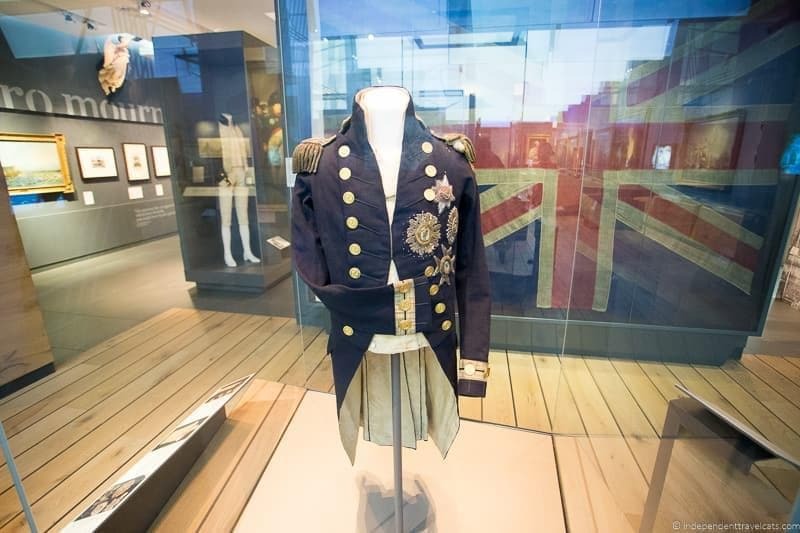 The National Maritime Museum is a great museum dedicated to the dramatic maritime history of Britain. The museum covers about everything related to the sea from shipping and trading, fishing, technology development, the Atlantic Slave trade, pirates and explorers, war battles at sea, leisure cruises, and the life of seamen throughout the ages. You’ll even find J.M.W. Turners’ largest painting The Battle of Trafalgar here. The museum is packed with information, exhibits, and fun interactive bits. The museum is free to visit. Not far away you can also visit the Queen’s House, a beautiful and architecturally significant former royal residence designed by Inigo Jones. Greenwich Park is yet another of the large royal parks in London that was once a royal hunting park. Here in its 183 green acres,you’ll find a number of attractions, historical ruins, memorials, sporting fields, a deer park, and gardens. Our favorites are the rose garden, the Ranger’s House which houses the Wernher Collection of art, and the Royal Observatory Greenwich. 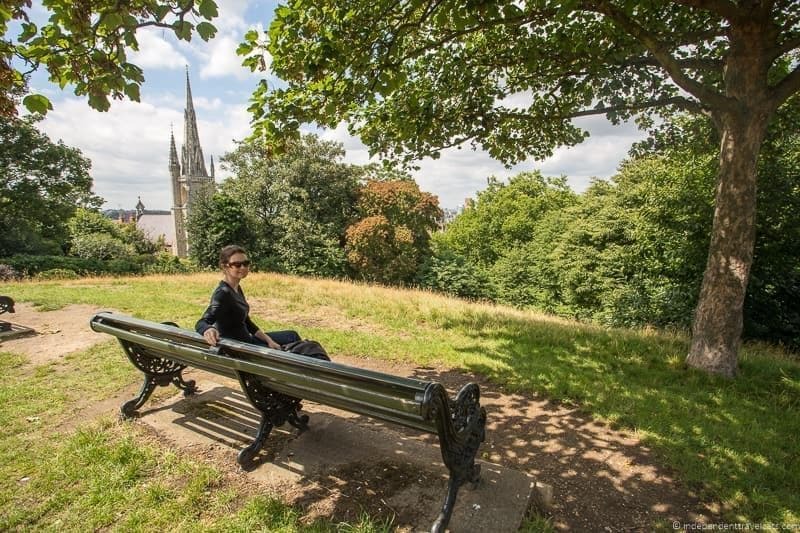 Note that the hill in the park is a bit steep but those who climb the hill are also rewarded by a nice view of London. The Royal Observatory Greenwich (fee*) is a well-known observatory that has played a significant role in the history of astronomy and navigation. 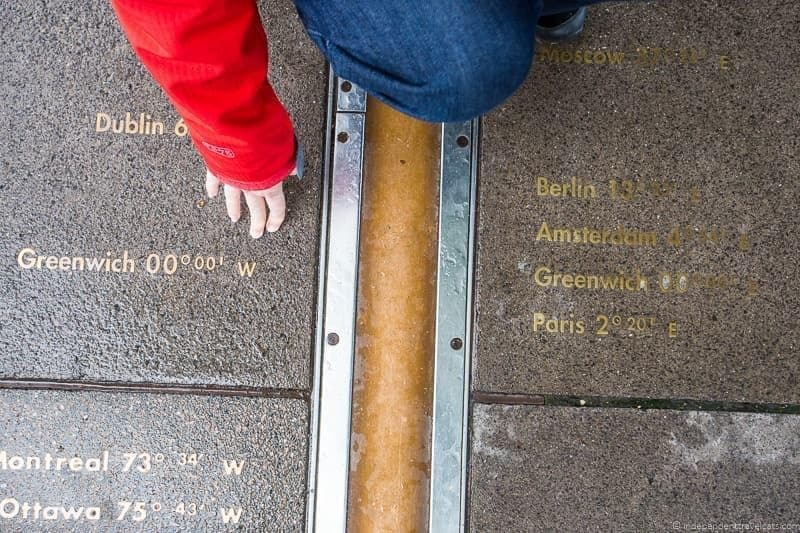 It is known as the location of the prime meridian and gave its name to Greenwich Mean Time (GMT) and sits first on the meridian line. The observatory is now maintained as a museum and visitors can learn about the history and discoveries at the observatory, stand on the famous Meridian line, visit Flamsteed House, see a camera obscura, and see the great equatorial telescope. Admission includes an audioguide to make the most of your self-guided visit. Nearby is the interactive Astronomy Centre (free to visit) and the attached Peter Harrison Planetarium (fee), which is currently London’s only planetarium. Greenwich Market has been in existence since the 18th century and is one of London’s best covered markets. The market sells food, clothing, flowers, antiques, crafts, souvenirs, art, and more. There are also a number of pubs and restaurants nearby. A great area to grab a snack or meal. If you are looking for a walk underneath the River Thames, you can take a walk across the Greenwich Foot Tunnel to the Isle of Dogs. The Isle of Dogs is surrounded by the Thames on three sides and while once na industrial dock area, it is mainly a residential area now. 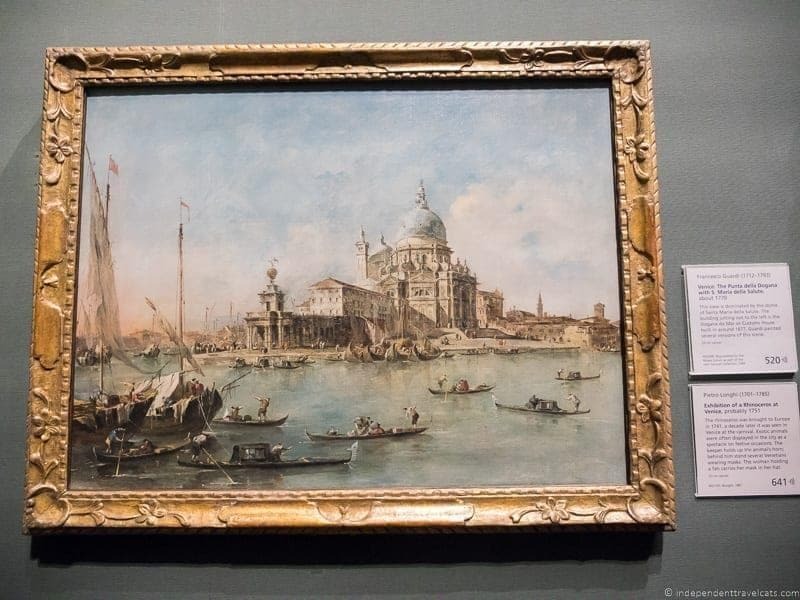 The view from the Island Gardens across the river of the Queen’s House and Greenwich Hospital was depicted by Canaletto in a few of his paintings. From here you can walk back across the tunnel to Greenwich or take public transit onto your destination. Note that if you haven’t done a Thames cruise yet and still want to, you can pick up a boat at the Greenwich Pier near the Greenwich foot tunnel entrance. Final Night Out? If you haven’t already taken in a West End Show or gone out for some of London’s nightlife, this is your last chance to do it. If you are looking for an earlier evening (big flight tomorrow? ), consider splurging on a nice dinner to enjoy your final evening in London and talk about all the great things you saw and did during your 6 days in London! We wanted to give you an example of the cost savings over 6 days in London if you have a London Pass. The following is based on the above itinerary although it doesn’t include every single attraction we suggested but includes what we believe is a realistic number for someone planning to actively sightsee based on the above itinerary. So as you can see in this example we ended up with a savings of £191.20 per person for a total cost savings of £382.40. This is definitely a considerable amount for six days of sightseeing! Even if we had visited significantly fewer sites during the six days in London, we would have still saved money with the London Pass. A general rule is that you need to visit an average of 2 to 3 attractions per day to save money with a 6 day London Pass. We highly recommend that all visitors check out the London Pass, especially if it is your first visit to London. It covers free entry to over 60 attractions and museums, plus a number of discounts on tours, restaurants, souvenirs, and theater tickets. Not only will it save many visitors money, it also saves times by providing fast track entry into certain busy sites. However it is not a great fit for everyone, and if you are not sure if it is a good fit or not, read our full review of the London Pass to help you decide as it breaks down the features, ways to purchase, the transport option, how to calculate your cost savings, and more. There you have our suggested London itinerary on how to spend 6 days in London. If you were planning a trip to London, which of these places would be must-sees on your itinerary? If you’ve visited London, what were you favorite spots in London? If you are planning a visit to London and have any questions about the itinerary or visiting London, just ask them in the comments below and as always we are happy to help! I know, there’s a lot of websites out there but this London itinerary is fantastic! Giving me so many great ideas for our vacation. Thanks! This is a great post. You have covered all the aspects of London. I love to live in London. Its nightlife is just amazing – Bar’s, Pubs, Theaters everything is just superb. Great info indeed on London. I and my wife will like to visit and tour London on 6 days tour starting from 15th -22nd December 2018.
we are coming from Lagos Nigeria. Can you please arrange the tour itinerary, accommodation inclusive with mode of payment. I am happy to hear that you enjoyed our 6 day London itinerary. 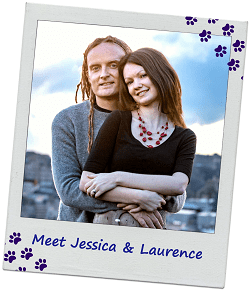 We are travel writers not a tour operator and cannot book a tour or accommodation for you. But we are happy to provide any additional tips you may have about what to do or where to stay. If you would like an itinerary and tour booked for you, I would contact a local travel agent or tour operator who operates in London. I am visiting London and Scotland in the month September and I was wondering how to go about it ! Though my daughter just came back from LSE after completing her summer schooling program and gave me lot of tips but your post solved all my problems. This is my first trip to London and staying almost 8 days there. Thank you so much for the valuable tips and information. Hi , Great Post. 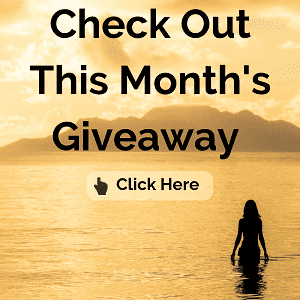 Just wanted to know which month did you travel in? I plan to travel to London in November, will the tourist spots mentioned in your post be open then? Wow, we are going to London in 2 months and this is the most helpful post I’ve come across over the past week in searching for things to do during our time in London. This London itinerary covers all of the things we had on our bucketlist plus so many other great places and tips on how to spend our time. My husband and I are very grateful and we’ll be printing this out and bring it along our our trip!! Our warm thanks from NYC! Wow! This is a really fabulous detailed guide to things to do in London! We’ve hit London from time to time over the years for a couple of nights here and a couple of nights there — before or after a cruise. We’ve enjoyed the double-decker, hop-on/hop-off sightseeing bus for an overview of the city. And oh the musicals and plays! That’s our favorite thing to do in London — take in a West End show. You’ve got us thinking that next time we should explore the Camden area. :-). What an amazing itinerary which will surely stop me walking around in awe and keep me in the right direction. We like to fit as much as we can in our days as it is so far to travel we make the very most of our time. Thanks for keeping all this info in one place so we can save for a reference when we finally make it to UK. Very good itinerary, Jessica. We’ve spent a week in London some years ago and visited all these places (except for the Royal Albert Hall), but I loved revisiting them with you through your beautiful post and pictures. We also bought the London Pass, like you, and saved a lot of money. For us it was worth it. What an amazing and detailed itinerary for London! I’m pinning it now for later planning. I love how you included alternatives in it. My favorite is Warner Bros. Studios and the Harry Potter set. I’m a self professed Potterhead (nerd, but I’m good with it lol). This post has definitely moved London up some notches on my travel bucket list and made it seem more affordable with the right planning. Jessica, you knocked it out of the park! Well, you always do but this time you hit the ball a bit harder. I visited London once but my time there was so, so reduced. I have come to the realization that London needs time (like other great cities in the world). I like to have 3 or 4 days in a city but I think that will never be enough in London. I will like to have at least a week in the city. And, I will love to follow parts of your itinerary. I am the one always looking for walking maps! Amazing list of things to do in London! We’ve already done many of them, but many are definite repeats if you ask me! My boys and I plan to spend 2 weeks in London over the Christmas Holidays, and will definitely refer back to this list for inspiration! This is an excellent post on London. We spent 4 days there in April and covered quite a bit, but would love to go back so have pinned your post for reference. 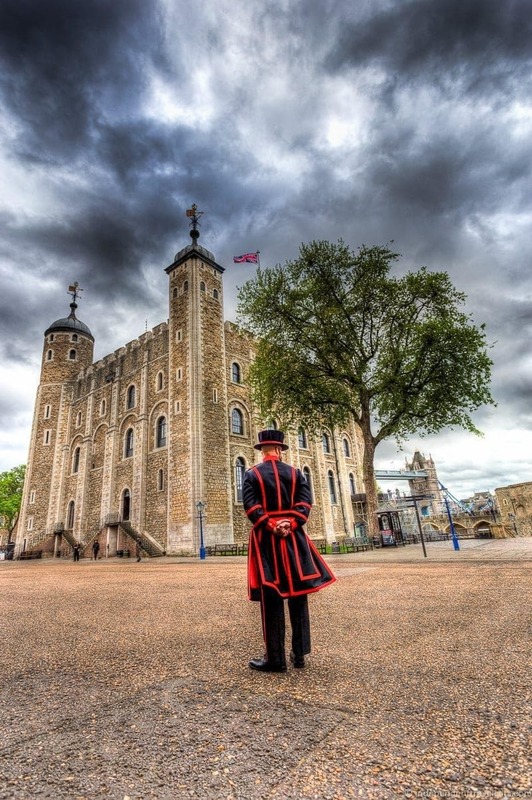 Your photo of the Beefeater at the Tower is spectacular! I just love how thorough and detailed your posts always are! Definitely a great resource for anyone planning to visit London. Even though I’ve spent a lot of time in London, I haven’t visited all the places on your list – especially the Greenwich area, or even St Paul’s Cathedral, which is actually pretty close to my apartment. Pinned this for when I go back to London later this year! This is a one of the most detailed guides to London I have seen for a long time. I have been to quite a few of these, but there’s still so many to visit. I’ve done soooo much in all of my many visits to London, but at the same time there is still sooo much to see and do! I can’t believe you managed it all in 6 days! That London Pass definitely seems like it’s worth the splurge! Pinned! Wow you really covered a lot and I can tell a lot of thought went into this post (like usual!). I have been to a lot of these but there are some I still need to visit, like the Churchill War rooms. I had no idea that you could save so much using the London pass, that is a great tip. Great post, you’ve managed to cover so many sides of London in six days, with so much detail. I love the city. However, I am biased as I’m a Londoner, it says so on my Birth Certificate. You’ve captured a brilliant mix of history, culture – London’s green spaces, museums and galleries. Glad you included Camden & Greenwich because both offer another side of London. 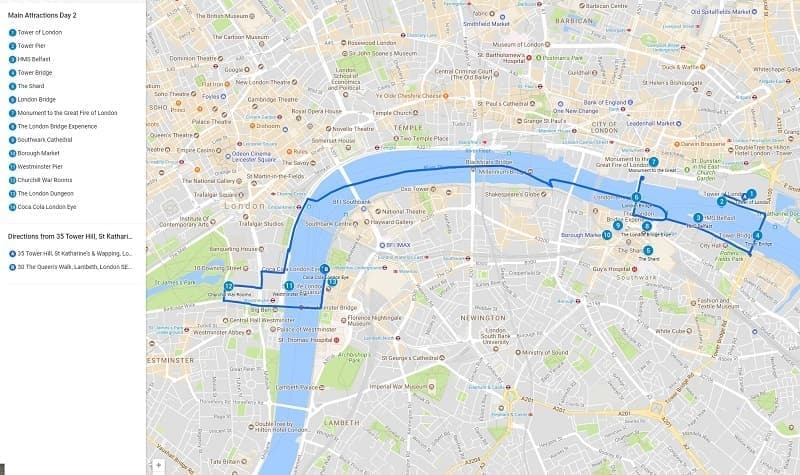 I have to agree the best way to see London is on foot – there’s so much to see, or bus if the feet are weary (The river cruise is also a good idea). I’d say avoid the underground unless it’s a distance (Smartphones & maps help here) because there’s always something to see when heading from A to B. As I said, fabulously detailed post, and will help a visitor see a chunk of London.